From the small port of Katakolon on the Ionian Coast, it's a short 30-minute drive to Olympia, where ancient Greeks came to celebrate the games. 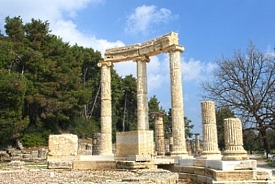 At the ruins of the sanctuary at Olympia, visitors can see the temples of Zeus and Hera, the floor of the original stadium and the Council House where athletes took the Olympic oath. A museum has a unique collection of Greek sculpture, ancient pieces of armor and bronze figurines found during the excavations.